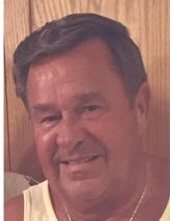 Robert J. Blake, 71, of Moosup, beloved husband of 52 years to Diane (VonWiegen) Blake passed away Jan. 23, 2019. He was born Feb. 27, 1947 in Putnam a son of the late Earl and Rose (Lamiotte) Blake and had resided in Moosup since 1971. Mr. Blake was a U.S. Army Veteran. He was employed by Foxwoods Resort & Casino for 17 years, retiring in 2009. Mr. Blake enjoyed woodworking and spending time with his family. Besides his wife he leaves a son Randy J. Blake and Jessica Stailing; a brother Richard Blake; a sister Rosalie Blake; 2 grandchildren Ryan Blake and Nicole Blake; 3 great grandchildren Robert J. Blake, Ethan Miller and Emma Burski; also numerous nieces and nephews. He was predeceased by a son Robert J. Blake, Jr; 2 brothers Donald Blake and Joseph Bourbeau and a sister Marie Guertin. Visiting hours are Sunday (1-27-19) from 1-3 PM at Dougherty Bros. Funeral Home 595 Norwich Rd. Plainfield, CT. Burial will be private. In lieu of flowers memorial gifts may be made to the family or Backus Hospital, A2, Oncology, 326 Washington St. Norwich, CT. 06360 or to a charity of the donor’s choice. To send flowers or a remembrance gift to the family of Robert J. Blake, please visit our Tribute Store. "Email Address" would like to share the life celebration of Robert J. Blake. Click on the "link" to go to share a favorite memory or leave a condolence message for the family.